The Dominican Republic offers much more than just all-inclusive resorts and touristy excursions. Especially during a road trip, the Dominican Republic will fascinate you with its mountain landscapes, the fantastic waterfalls and the lush vegetation, regardless if you are doing an individual journey with your rental car, travelling with a private guide or joining a conventional group trip. In order to give you an impression of the varied regions of the island, we have listed the top 5 panorama streets for road trips in the Dominican Republic, which we have visited several times and always amaze us. 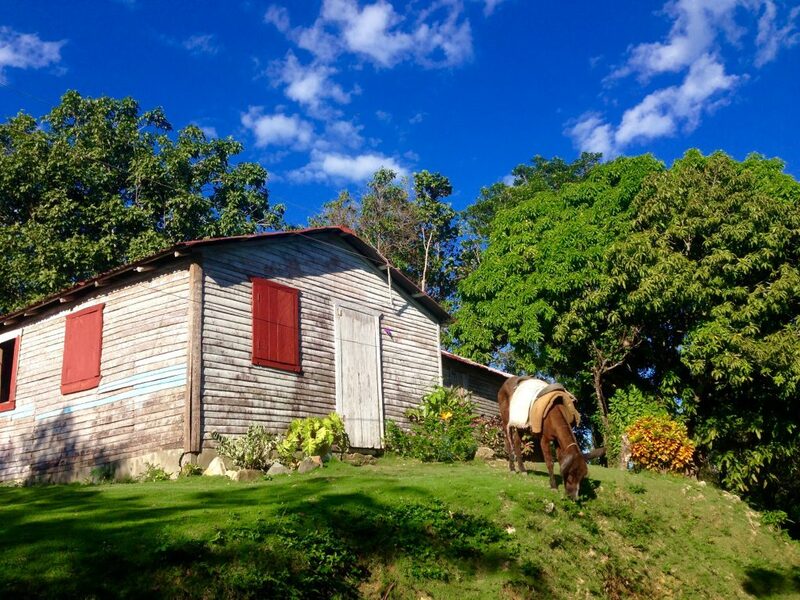 The northern mountain range is a hidden gem among the distinct regions of the Dominican Republic. Especially in the area of eco-tourism there is much to discover like cacao or coffee farms, exciting eco lodges, hikes to undiscovered waterfalls or canyoning through the gorges of the mountains. In the middle of this landscape is the so called “Ruta panorámica”, which leads 30 km through small villages, along many local fruit and food stands and an impressive mountain scenery. This panoramia route takes you up to 800 meters offering you a magnificent view whether you are traveling in a rental car or during a guided road trip. Our recommendation: There is a sustainable Eco-Lodge during the descent to Puerto Plata offering a spectacular view to the ccean that can be booked for an overnight stay. The south-west of the Dominican Republic is for sure one of the most exciting regions to discover during a road trip in the Dominican Republic. Barely known and often ignored by tourists it offers great sights such as the Lago Enriquillo, a salt water lake where you can find crocodiles and iguanas, the Laguna Oviedo which provides living space to wild flamingos and birds and the most beautiful beach of the Dominican Republic, Bahía de las Águilas. Even the road that takes you to this unique places is worth seeing with its small colorful villages, welcoming local bars, a wild coast line and the constant changing landscape. From tropical vegetation with waterfalls and jungle atmosphere to a barren and uninhabited steppe area, within 50 kilometers this road has everything to offer. Luckily there are many view points on the road where you can stop with your rental car to enjoy the panorama and take that perfect photo of the stunning south-west coast! Our recommendation: You should plan 2 full days for the south-western region in order to compensate the relatively long driving time. The northern coast of the Dominican Republic is still largely unaffected by international tourism with the exception of Puerto Plata and Cabarete. For this reason, there is no well-developed motorway like there is from Santo Domingo to Punta Cana or to Samaná, which is a benefit if you are looking for a real road trip experience. Especially heading east from Rio San Juan we recommend you to roll down your windows, put on some good music and let the natural scenery pass consisting of palm trees, natural beaches and dramatic coastal sections. Along this panoramia route you can make a break at amazing places like the mile long beach Playa Grande or the unique crystal clear lagoon Laguna Dudu. If you are really adventurous, you can also discover the completely unknown sides of the coast and drive to the beach of Arroyo Salado, the El Saltadero waterfall or the national park Cabo Frances Viejo. Our recommendation: You can stop at the small family hotel Las Puertas del Paraiso which is 2 mile away from the main road and definitely worth a visit for lunch (Friday to Sunday, or daily for dinner). We really recommend the Lambi Ceviche, maybe the best you can find in the Dominican Republic. 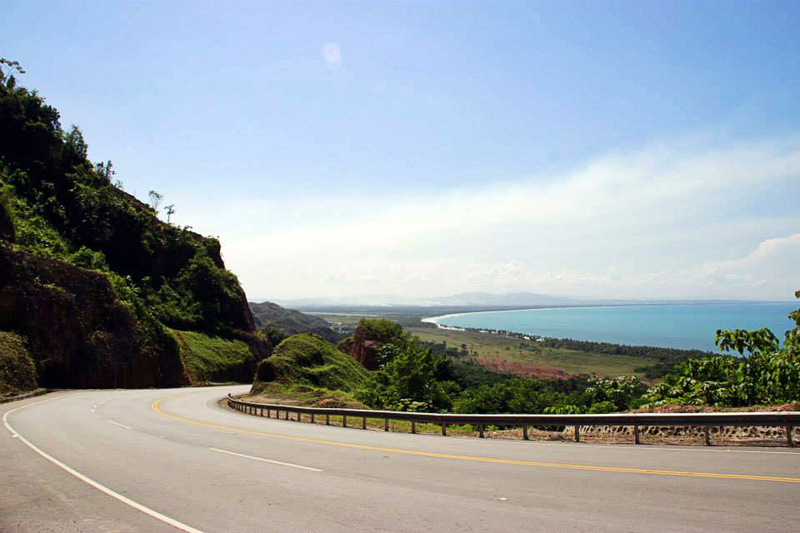 If you continue to the east along the north coast and pass through Nagua, you will arrive at the west end of the “Boulevard del Atlantico”, a newly opened section of the Samana motorway opened in 2011 that connects the popular and vibrant town of Las Terrenas with Santo Domingo and the West. This panorama road will lead visitors through a spectacular rocky landscape offering great views of the north coast towards Nagua. A little bit further, the view point “Mirador” gives you a fantastic view of Las Terrenas, its miles of beaches and the feeling of being surrounded by a million palm trees. 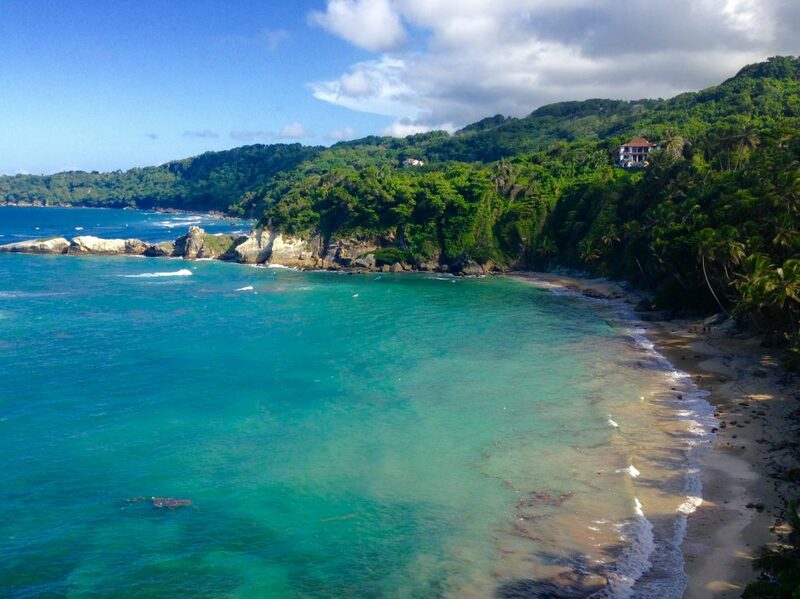 This and more is what awaits you while discovering Samana during your road trip in the Dominican Republic. Our recommendation: Since this is a private motorway, a toll of about 11 USD has to be paid. No worries, it is definitely worth it considering the views and the saved up time to get to Las Terrenas along the old road. If you are talking about panorama roads on the island of Hispaniola, this route has to be mentioned, as it is the most challenging road trip in the Dominican Republic. For this route we seriously recommend to rent an off-road SUV instead of a regular car, since you will be facing a 100 kilometers dirt road from San Jose de Ocoa to Constanza reaching an altitude of up to 2500 meters, making it the highest road of the Caribbean. Depending on the weather conditions and driving experience it can be an exhausting trip but it compensates with spectacular views of the central mountain range with its frequently changing and untouched vegetation. 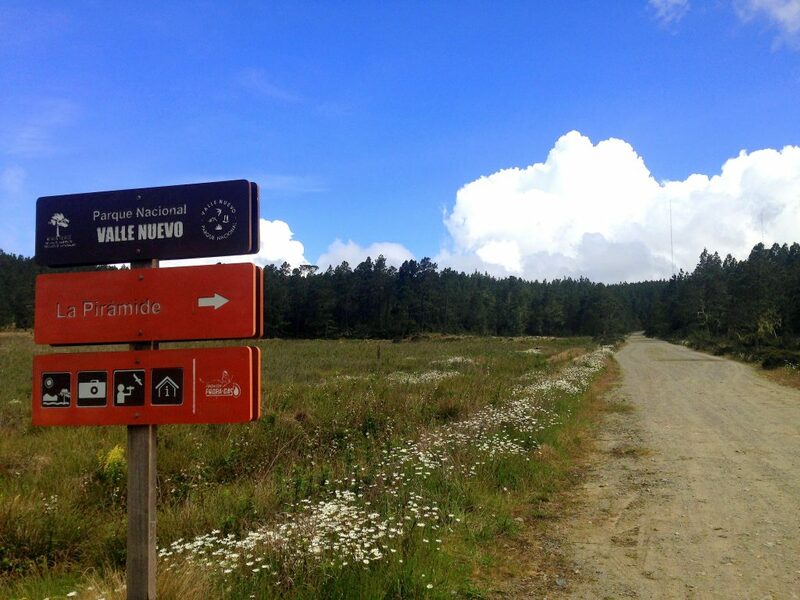 On the way you can plan a stop at the “pyramids” in the Valle Nuevo or take one of the numerous small hikes that have recently been signposted in the national park. Our recommendation: At about three-quarters of the road you can find a pretty bungalow hotel that offers a great panoramic mountain view. Take warm clothes with you, because at night the thermometer can drop to one-digit temperatures. 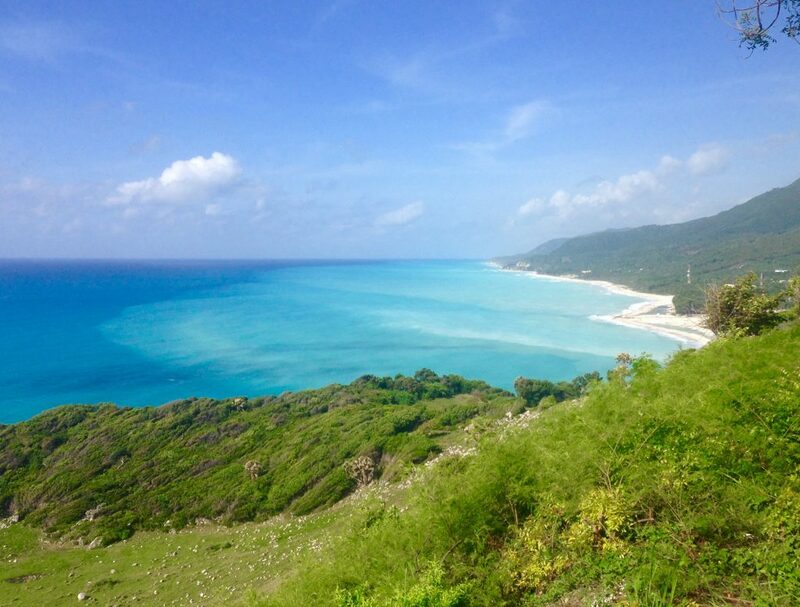 Dominican Expert offers a number of exciting road trips around the Dominican Republic which include the above mentioned panorama routes (for example our “From East to West”-Road Trip). During a personal welcome briefing with a tropical and freshly prepared fruit cocktail, we will inform you about the highlights of each road trip and give you even more insider tips. Especially if you are traveling on your own in the Dominican Republic, you will benefit from these recommendations. Alternatively, we can also organize a road trip with a private guide, who will take you to the most beautiful sights in the country and give you all the information about history, culture, country and people. If you prefer traveling with like-minded people, we will be happy to arrange a group trip for you in the Dominican Republic. Would you like to explore the top 5 panorama routes on a road trip through the Dominican Republic? I’m wondering about road conditions and potholes on the road toLas Galeras. Will a compact car make it? thanks for your reply. You definetely can drive with a compact car to Las Galeras, besides some very short stretches the road is absolutely fine, it is one of the major road of Samaná. Let us know if you need any further help planning your holiday in the Dominican Republic.